Kate Middleton can rest assured that her hubby Prince William will make it to the birth of her first baby this week. The Queen has put a high-speed helicopter on standby for Prince William’s disposal as soon as the pregnant Duchess of Cambridge goes into labour. Kate Middleton‘s baby is thought to be due mid-July, with the date of 13 July being reported in the global press – but she could give birth to the royal heir at any moment. The generous move by the Queen means that Prince William can continue with his role as a rescue pilot with the RAF right up until the very moment that Kate needs him. The Sunday People reports that The 175mph Sikorsky S-76c chopper will rush Prince William from his base in Anglesey to London and will mean he will avoid any traffic or paparazzi along the way. 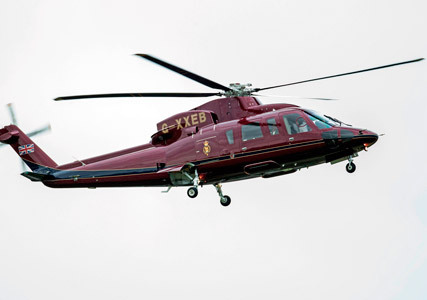 The maroon Sikorsky of the Queen’s Flight is now on standby at RAF Northolt, and a pilot will be on hand ready to fly Prince William the 600 miles to the capital. But a palace spokesperson has confirmed that rail and road were still being considered as possible travel options should the weather take an unexpected turn. Kate is currently resting at her parents’ home in Berkshire, while hundreds of photographers and tv crews wait outside St Mary’s Hospital in Paddington for her.